SEUTTER - Germaniae Aliorumque quorundam locorum Europae Poliometria. . .
SEUTTER, M. - Germaniae Aliorumque quorundam locorum Europae Poliometria. . .
Germaniae Aliorumque quorundam locorum Europae Poliometria. . . - SEUTTER, M.
Title : Germaniae Aliorumque quorundam locorum Europae Poliometria. . .. Size : 7.3 x 10.2 inches. / 18.5 x 26.0 cm. Description :Distance chart with miniature inset map of Germany. The distance chart is giving distances between the main German cities. 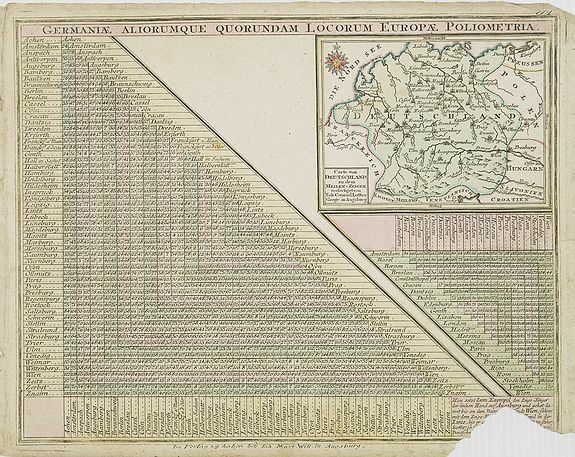 From Atlas Minor, here published by Johann Martin Will, with his address in bottom center of the map. Condition : Paper age-toned .Torn right bottom corner and part of the engraved text. Left and right margins are frayed. Good impression.